Can You Use Regular Toothpaste on Dogs? There are many considerations that are made when taking on the responsibility of a new pet, but new dog owners seldom consider the importance of dog toothpaste in the health of their new pup. By using a high-quality dog toothpaste, dog owners can significantly decrease the necessity of veterinarian visits as well as improving their dog’s quality of life. If the thought of brushing your dog’s teeth sounds a little crazy to you – like giving your pup a massage, maybe – you should have a quick word with your vet! They will probably politely tell you that regular dental care for your pup is as important to its quality of life as it is to yours. While it is true that dogs have gone thousands of years without toothbrushes, dental cleanings and x-ray’s, their teeth suffered for it. Pet owners thousands of years ago did not have any access to hygiene products for themselves, let alone their dogs. The good news is that today, even the best dog toothpaste products are extremely cheap and by making a small investment in preventative care, you can save thousands of dollars by avoiding more serious issues like gum disease, cavities, tooth loss, chronic pain, and surgery. The main function of the mouth and teeth is to soften food with chewing and saliva and to prepare it for digestion in the gastrointestinal tract. A dog’s mouth is not just the entrance to its digestive system. Dogs quite literally use their mouths to taste life itself. They investigate the world around them with their lips, teeth, and tongue. They even play games with their mouths and get rid of excess heat by panting. As a result, there is a great variety of medical conditions that affect dog’s mouths, particularly their teeth. A healthy mouth is vital for good general health. Substances in the saliva act as natural antiseptics, reducing the risk of infection, while the physical act of tearing and chewing food massages and cleans the gums. Your dog’s teeth should be well spaced, so they do not trap debris. Unusual growths inside the mouth. A dog’s dental health is often neglected by dog owners due to the popular myth that dog teeth are resistant to cavity and infection. Dog teeth are very similar to human teeth and with dog foods being filled with preservatives and in many cases, sugar, the need for a high-quality dog toothpaste and a regular brushing schedule becomes that much more important. If a dog’s dental health is completely ignored and allowed to become a serious problem tooth extractions and surgery might be required and the estimate for those nears over $500 to $700! By purchasing a high-quality dog toothpaste and sticking to a regular brushing schedule, dog owners can completely avoid having to pay for expensive teeth cleanings and surgery. Down below you will find our recommendations for the best dog toothpaste so you can choose the perfect product for your pet. There are no available products on the market that will improve your dog’s oral hygiene as well as regular brushing with appropriate toothpaste. Simply stated, there is no substitute for brushing your dog’s teeth but the toothpaste you use is almost as important. In the past, it was considered that just brushing is enough for keeping your dog’s dental hygiene on a satisfying level. Today it is scientifically proven and well understood that brushing, without using toothpaste, is almost the same as not brushing at all. In a nutshell, if you want to keep your dog’s mouth clean and healthy, you have to use both toothbrush and toothpaste. The ideal dog toothpaste goes beyond being safe and tasty. Have a lingering effect that lasts a long time after the brushing has finished. Dog toothpastes are made of ingredients that are not only efficient and effective for keeping your dog’s mouth clean but also safe, edible and non-toxic. Silica – is a type of gentle abrasive, effective at scraping and removing plaque and tartar away from your dog’s teeth surface. Do not get confused by the word abrasive. The silica is strong enough to scour away the build-up, but gentle enough not to hurt your dog’s mouth. Additionally, the silica has the power to polish the surface of the teeth. Emulsifiers – are salts that help control the tartar build-up. The most commonly used emulsifier in dog toothpaste is the tetrapotassium phosphate. This compound is also used in many everyday products like cheese, ice cream, and cleaning products. Enzymes – are proteins potent for reducing the number of bacteria in your dog’s mouth by keeping the microorganism’s growth at a minimum, thus eliminating bad doggy breath. Commonly used enzymes are glucose oxidase and lactoperoxidase. Dog toothpastes that contain these enzymes are labeled as enzymatic. Sweeteners – are used to add more appealing flavor to the paste. Toothpastes may contain either natural or artificial sweetener. Dog toothpaste usually contains sorbitol which can be naturally found in many fruits. Sorbitol should never be confused with xylitol (also a natural sweetener, but toxic to dogs). Put simply – Use the best dog toothpaste available. The best dog toothpastes do not contain toxic ingredients like fluoride and are safe for dogs to consume, better yet, they taste great which makes the brushing process much easier for you! Toothpaste made for humans is not recommended for dogs. A dog does not know to spit out toothpaste during the brushing process, so unlike a human, a dog will swallow all of the toothpaste in their mouth. Human toothpaste also contains ingredients like fluoride which can make a dog sick. Although fluoride treatment is now commonly and successfully applied in human dentistry it is not used on dogs. This means owners should not clean their dog’s teeth with human toothpaste containing fluoride. One reason is that fluoride metabolism is different in dogs and people. The fluoride is a non-edible ingredient that may actually be harmful to dogs under 6 months and is toxic to dogs of any age if swallowed in larger quantities. Almost all human toothpastes contain fluoride. Another problem with regular toothpastes for dogs is that they often contain a sweetener known as xylitol. The xylitol is toxic to dogs even if ingested in small amounts. It causes vomiting loss of coordination, seizures and in more severe cases liver failure and even death. The third reason why human toothpastes should not be used for dogs is their taste. Even we find some toothpaste tastes to be weird. So imagine how our dogs would feel. Specially formulated toothpastes for dogs are made of palatable ingredients that offer amazing tastes. All in all, regular, human toothpaste should not be used for dogs simply because dogs cannot be taught to spit out the toothpaste and eliminate its harmful, non-edible ingredients the way we do it. What is Enzymatic Toothpaste for Dogs? C.E.T Enzymatic Toothpaste is a brand of dog toothpaste, considered by many to be the best choice for pet owners. We actually review the product in detail below so won’t give too much away but it is found to be great tasting and highly favored by many of the dogs we trailed the toothpaste with. We’ve found dogs to enjoy it so much they tend to like it almost as much as many of the dog treats we have reviewed. Virbac Enzymatic Toothpaste is seriously the best dog toothpaste we recommend by a long long way! We have heard many stories of pet owners struggling for years, almost forcing their dog to brush their teeth, and finally finding a toothpaste that their dog likes with this product. Virbac makes toothpaste in many different flavors but we have found dogs seem to really enjoy the “poultry” or chicken flavor. Even when trying this product with new dogs, after pulling out the toothbrush we find dogs running back, wagging their tail in anticipation of the ‘treat’. Not only is the brushing process easier, the toothpaste is made from high-quality ingredients specially formulated for dogs. It helps fight cavities, reduces the formation of plaque and most importantly helps you avoid visits to the vet because of poor dental health issues! Another absolutely great product, it’s hard to say why exactly this isn’t the best dog toothpaste we reviewed but all we could decide on was the excellent results of the first product. “Finally! After months of searching for a doggy toothpaste my pup can stomach I am so grateful to stumble on kissable. I have tried a multitude of high price dog toothpastes all of which my dog hated! It wasn’t just the toothpaste that was the problem, my dog has some severe dental issues which makes it touching and brushing very painful. Dental visits are also quite costly and I have been trying to avoid those like the plaque. On a whim, I decided to purchase KissAble, the price was low and I figured “hey it’s worth a shot!”. As usual, it was difficult getting the toothbrush in my pup’s mouth but after I did the process went smoothly! This was one of the very first dog toothpastes we ever trailed at Cleaner Paws and after trying various others since then, we finally come to an agreement with our dogs over a toothpaste we both like (our pets for the taste and us for the price). Vet’s Best is the one we stuck with for a long time and there are a number of reasons for this longevity. We are always worried about what products we put into our own mouths and the same goes for ingredients found in pet products but with Vet’s Best you know you’re in good hands. Vet’s Best is formulated with some seriously high-quality ingredients for the price. It has Aloe, Neem Oil, Grapefruit Seed Extract and dental enzymes. We found dogs love the taste and brushing is only made easier with this product. 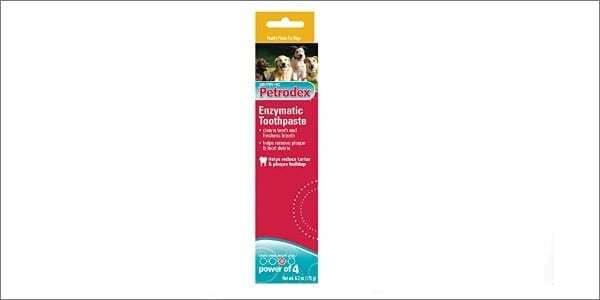 Petrodex is one of the slightly more costly more expensive toothpastes we have found but after reading a few reviews about how dogs loved the taste and how effective the toothpaste was for dental issues, we took the plunge and bought a tube to try. We hoped and prayed our dog would like this toothpaste and when it arrived, I started brushing their teeth straight away and what a difference! No more running away and whining, we found our dogs was actually enjoying getting their teeth brushed. It’s made my job as an owner much easier and the ingredients are probably higher quality than the stuff I use myself which is just great for my pets. Tropiclean Fresh Breath Plaque Removal Gel was another product that we found was summed up perfectly by one of our readers. We tried it ourselves and couldn’t agree more, read on for what they had to say: “My dog’s breath was seriously getting out of hand! It had become difficult to hold her in my lap, it was that bad! I tried buying different kinds of food, changing the water bowl and even taking her to the vet but nothing was working. After months of failing at everything I tried, I decided to order a new kind of toothpaste. It was probably the best decision I made for my dog and for myself. I can finally hold her in my lap again! Start by putting a little dog toothpaste on the toothbrush and letting your dog lick the dog toothpaste off. By doing this, you are allowing the dog to become familiar with the taste of the dog toothpaste which will make brushing much easier. Do only this routine for the first few weeks to get the dog used to the taste of the dog toothpaste, don’t try brushing yet! When you feel the dog has gotten comfortable with this routine, you can begin to brush the teeth. Do this by raising the dog’s lips to expose the teeth and gums, then you can brush away! Pro-tip: do not forcefully open the dogs, it will lead to panic and struggling which will make the brushing process more difficult in the future. Get your dog comfortable with brushing while they are young. If you have just adopted a new furry friend, start by getting her comfortable with your touch. Touch the inside of your dog’s mouth, their front, and back teeth. Then, slowly brush the front teeth with a high-quality dog toothpaste. While brushing, pay attention to how your dog reacts, make sure the dog feels comfortable. Then, brush the back teeth. After a few rounds of dental care, dental care should become routine for your dog, she will get used to the taste of the toothpaste and the feel of the toothbrush. Dental problems tend to be much more severe in the back teeth for a dog as they use these teeth to crush hard foods. It is very important that you reach those teeth with a high-quality dog toothpaste in order to avoid unnecessary vet visits! Brushing can be a stressful part of a dog’s day. Before and after brushing it is advised that you give your dog plenty of praise and even a little bit of play-time as a reward for their good behavior. If your dog has done a really good job, consider giving them a treat, they will appreciate it! First things first, you should never use human mouthwash. Regular mouthwashes are not designed to be swallowed meaning they aren’t suitable for your dog. Human mouthwash products also contain ingredients that may not be safe for your dogs to consume so it is vital you steer clear of these when caring for your dog’s dental hygiene. However that doesn’t mean you can’t use mouthwash at all when and dog mouthwash may be beneficial in fighting off tartar, bacteria, and plaque that has accumulated on your dog’s teeth. Dog mouthwash can also be effective in combating your dog’s bad breath but finding the right product is essential. Water additives have been marketed as dog toothbrushes in a bowl and can be added to your pet’s food. Water additives have many of the benefits outlined above and function in the same way as a regular mouthwash. You can also make a homemade dog mouthwash for your pet but just make sure you follow a recipe from a reputable source. When it comes to brushing your dog’s teeth there are some rules you need to follow. Rule number one is to use a dog toothbrush. As surprisingly as it may sound, yes…there are special toothbrushes for dogs. A good dog toothbrush features an angled head and soft, but firmly rooted bristles. The angled head makes it easier to clean all hard-to-reach places. The bristles need to be firmly rooted in order to avoid their dislodging and sticking between teeth. The single head brush – This is the simplest and probably the most effective toothbrush for dogs. It has angled head and soft but efficient bristles. The multiple-head brush – The multiple head brushes have 2-3 differently sized sets of bristles, designed to clean all surfaces at once. On the flip side, this brush is useless, unless it fits your dog’s teeth size perfectly and it is not very comfortable to use as it implies using it while standing behind your dog. The finger brush – The finger brush, as its name implies itself, slips directly on your finger. Having the bristles right on your fingertips, reaching every spot is quite easy. The finger brush is a one-size-fits-all type of product that cannot be used on dogs you do not completely trust or are prone to biting. Keep in mind that if you have two dogs, each dog needs his own toothbrush in order to prevent cross-contamination. Luckily, dental health problems are easily preventable. Brush your dog’s teeth regularly, preferably every day – Recent studies suggest that brushing less than 3 times a week has the same effect as no brushing at all. Therefore it is recommended to brush your dog’s teeth at least every other day. Turmeric toothpaste – you can make a mixture of natural essential oil, turmeric, and parsley. The turmeric whitens the dog’s teeth, while the parsley act as an antibacterial agent. Coconut oil toothpaste – this ingredient is excellent for keeping your dog’s teeth white and its breath fresh.